THE “legitimate” theatre, as it is constituted at present, is doomed to extinction. The motion pictures, which for fifty cents give the public an excellent two-hour entertainment, are too strong competition for the legitimate theatre where seats cost from $2.50 upwards. Yet, up to now, there has been no way to sell seats in the legitimate houses cheaper, for obvious reasons. Even the largest do not seat more than three thousand persons; so that the cost of the production, the salaries of the actors, the rent of the theatre, must all be borne by a comparatively small audience. 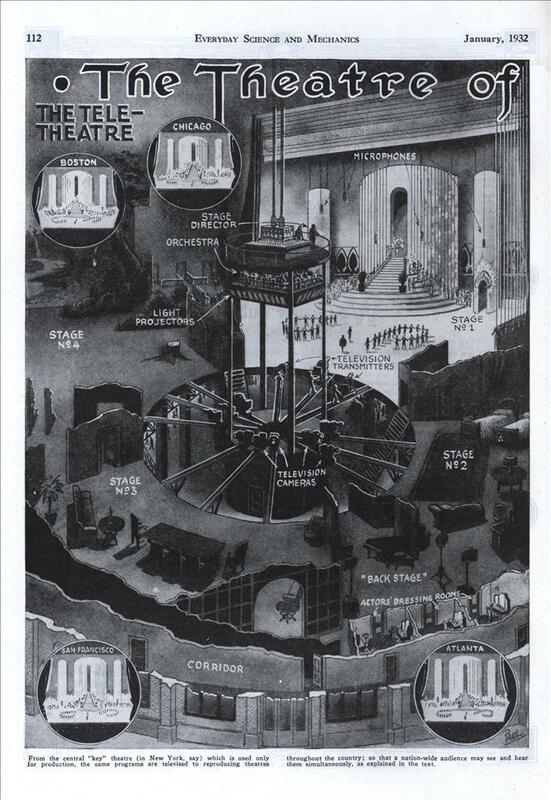 Suppose that one of the elaborate New York productions, such as the “Follies,” could be viewed at the same time by three million people. Obviously, the cost per seat to the audience, instead of running up to $0.60 (for good orchestra seats) and more, as it does today, would come down to 50c per seat, and yield a handsome profit. And this is exactly what the theatre of the future will do. I have shown here my conception of the future theatre, which by this time must become obvious; with the event of television, the legitimate theatre can be not only saved, but made to reach undreamt-of heights which cannot even be foreseen today. During the month of October, the Broadway Theatre in New York City exhibited, for the first time on any stage, a giant television screen 10-ft. square. Before the production, I was requested by the management to suggest various ideas as to what should be televisioned. One of my suggestions which was adopted, was to televise the performance in another theatre and show the results on the television screen in the Broadway house. This suggestion was accepted; and part of the regular show of the Theatre Guild was shown on the screen of the Broadway Theatre. It was the first time in history that two theatres had thus been linked together, the production of one stage being shown on another. This is the principle of the theatre of the future. I now go a step further and show what will happen ten years hence. In New York City, or Chicago, we will have a central key theatre, located in a building erected specially for that purpose, which will have a large number of stages. There will, however, be no audience in this theatre; no one will view the performance directly excepting the stage director and stage attendants. The curtain rises and the production starts. A battery of television transmitters picks up the light impulses, while a battery of microphones picks up the sounds. The results of both pickups are transmitted over a wire net to distant cities; just as, today, the headquarters of the New York broadcast studios are connected by wire with distant parts of the country. There will be, however, this important difference. At the present time every one listens-in to radio programs at his home; whereas in the future, you will have minate behind each orchestra seat in such a way that the action ejects a stream of invisible gas particles, containing the odor which now envelopes each member of the audience. Of course, the scent organist of the future will not rest after simply depressing a single key, which would give the audience an excessive scent of, let us say, heliotrope, jasmine, narcissus, rose, etc. If he is a skillful scent organist he will be able to depress several keys at one time, and combine a number of delightful new scent combinations; just as the skillful musical organist of today, by depressing a number of keys, can produce novel effects upon our auditory nerves. In our illustration is shown in detail how the small feed-pipes terminate close together in a small round boxlike affair, where various odors may be mixed, and the result of the mixture conveyed into the audience. Lest you think that the idea is far fetched, I wish to point out that some years ago, at the Music Box Theatre in New York, during a certain performance depicting a California orange grove, the audience were surprised and delighted to find the entire auditorium permeated with orange scent, which was released in the basement and blown through the ventilators so that, at the appropriate time, the entire auditorium was bathed in a delightful orange scent. However, even if you had access to that, blowing up a TV picture to dozens of feet across is very difficult. As for “Smell-O-Vision”, that has been tried, but basically it’s just silly. 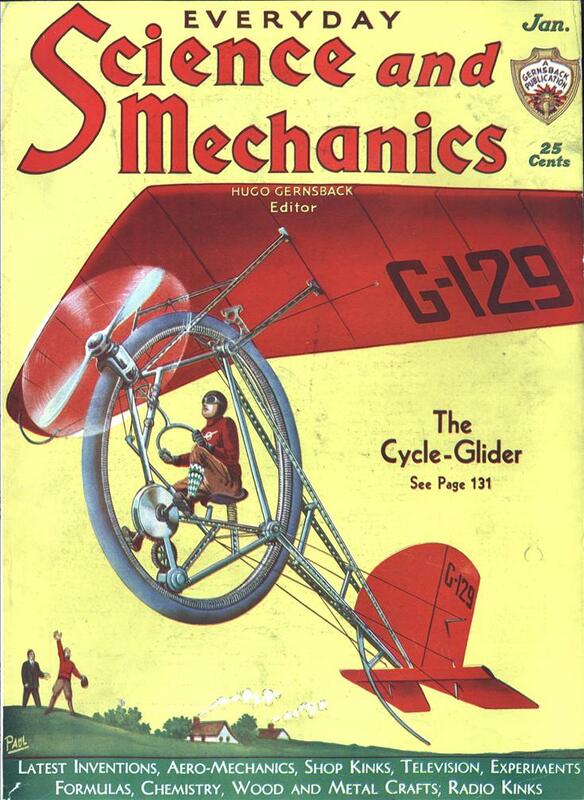 As outlandish as his ideas are, Gernsback was right about his basic premise. That in order to compete with television theaters must improve upon and create novel experiences for the audience or else they will prefer the convenience of their own home entertainment systems. Today we have 70mm 3D dolby surrondotron and what not. Even Broadway continues to create bigger and bolder spectacles. There seems to be a page or so (probably page 173) missing from the middle of this article. Science and Mechanics seems to have gotten their continuations mixed up, which doesn’t help things. This guy was right on about the use of television. Several of our theaters where I live are equipped to display HDTV broadcasts on the big screen. We saw Carmen broadcast from the Met and Fela from London (although that one was not live). Fortunately the scent organ was not in operation.